Imagine a future where — as long as you have your phone — you have your ID. That’s what the Ontario government is working towards, in partnership with Ottawa-based identity management platform Bluink. The company is developing eID-Me, a tool that will allow Ontarians to prove their identity both for online and face-to-face services through their mobile device. Bluink says eID-ME will be a full-fledged alternative to an Ontario Driver’s Licence or Ontario health card, authorized via biometric input or password input on the user’s smartphone. The tool will also work for web services (both government and third-party), based on the same locally-stored solution that Bluink offers commercially. Bluink says storing identity information on users’ smartphones eliminates the need for centralized databases where large amounts of data are vulnerable to targeted attack. The company also notes that with its new technology, the user always sees who is requesting identity information and can choose specific pieces of information to reveal. For example, users buying alcohol can reveal their age and photo, without needing to show their address or driver’s licence. 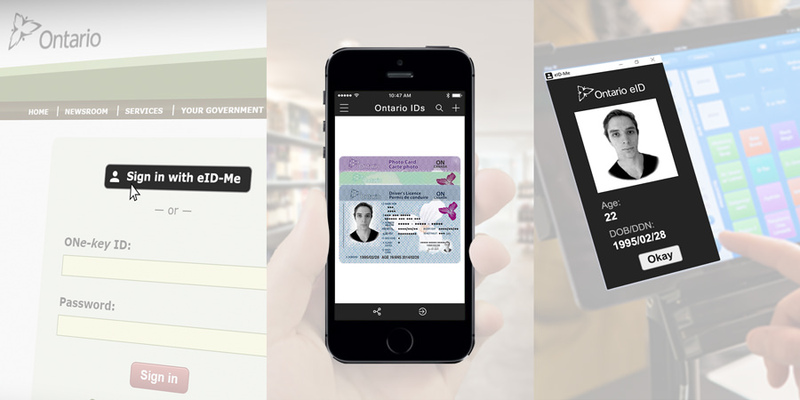 Ontarians with existing identity records will be able to register for eID-Me directly from their smartphones, eliminating the need to travel to ServiceOntario centres for applications, says Blueink. Bluink says it will develop eID-Me with the Ontario government in partnership with cyber security firm Crypto4A, point-of-sale company Canadian POS and Carleton University over the next year, as part of Ontario’s Small Business Innovation Challenge. The company promises the tool will be ready for pilot deployments in fall 2018.